With the commencement of the New Year, we all strive towards new goals with improved health being an overwhelming and significant aim. Individual health, public health, and planetary health are all interrelated in our delicate biosphere and through multiple inter-dependent bio-geophysical and socio-economic systems. The air we breathe and pollute know no jurisdictional boundaries, while similarly our waterways flow carrying essential resources as well as contaminates across political regions to the oceans that are already damaged and increasingly reactive to anthropogenic impacts. The 2015 seminal report of the Lancet Commission declared the response to climate change as the “the greatest global health opportunity or threat of the 21st century”. Macro and micro health concerns are all underpinned by the health of our natural environment. Human health is dependent upon ecological processes and natural resources for medicines, clean air, safe drinking water, and physical and mental well-being. When these ecological resources are destroyed so is the fate of our health, communities, and quality of life (Figure 1). 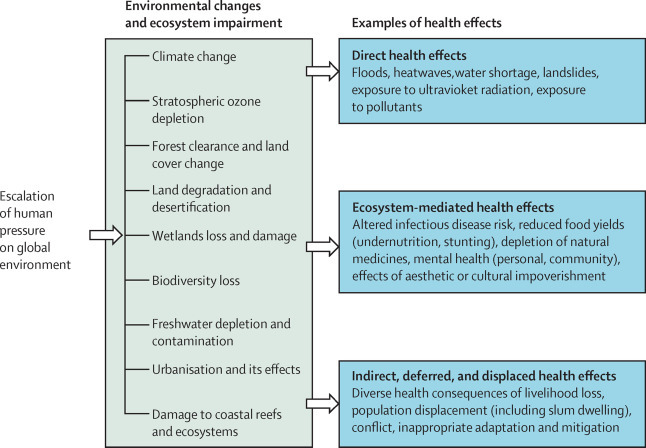 The climate impacts on health are a threat multiplier inflicting stress on human bodies and minds while weakening water, food, housing, biodiversity, and infrastructural systems that directly or indirectly influence health outcomes. As the world’s historically largest per capita polluter, the United States resistance towards greater environmental protection is curiously juxtaposed to the declining quality of health and life span in the country. The average U.S. life expectancy of 78.7 years ranks 27th among the 35 most developed countries despite more than 2 – 3 times higher health care expenditures. All the while, the U.S. ecological footprint is recorded at 8.22 global hectares/person in comparison to the global average of 2.84 gha/person, reflecting a greater and avarice resource use. Understanding the symbiotic relationship between human well-being and nature is a function of childhood experiences, education, and policy frameworks that foster political and personal commitments to curb environmental impacts and are fundamental to promote behavioral and societal change towards constructive climate action. Climate change is putting human health at risk and complicating the ability to lead a healthy lifestyle. Respiratory health has been comprised by air pollution, the result of carbon emissions generated by fossil fuel sourced power plants, automobile use and industrial production, fueled by increasing demands of consumer consumption. Chronic Obstructive Pulmonary Disease (COPD) is the fourth leading cause of death worldwide and yet a preventable public health threat. In the U.S., air pollution affects four out of every 10 people or 39% of the population live in counties with excess particulate matter and ozone levels that do not meet clean air standards. Western and Southwestern states are the most affected given their industrial economies, topographies and behavioral patterns, while California despite its climate action advances, fared amongst the worst for air quality in 2017, driven in part by increasing vehicular miles travelled. Air pollution is exacerbated by climatic changes, including higher temperatures, greater precipitation, and raging wildfires, all occurring at increasing intensities, and has boosted the incidences of asthma and allergies. According to the World Health Organization, air pollution accounts for approximately three million deaths per year worldwide with high potential for continued increase as vehicular use rises. 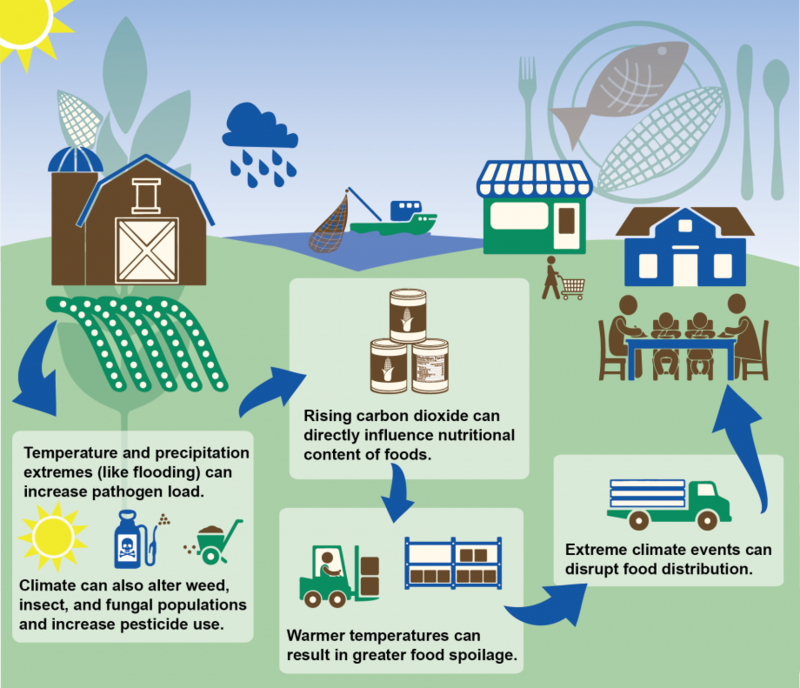 Other climatic impacts on public health involve an array of local and global systems, whereby the food system (Fig. 2) is particularly vulnerable with direct impact on the human condition. Scorching temperatures, deluging precipitation, and abrupt weather patterns disrupt planting seasons and damage crops, paralyze food distribution systems and bring about food contamination and spoilage. Compounding these issues of food security are further health concerns aggravated by the higher concentrations of atmospheric carbon dioxide that lower nutritional values of common staple crops, including rice, wheat, and potatoes. 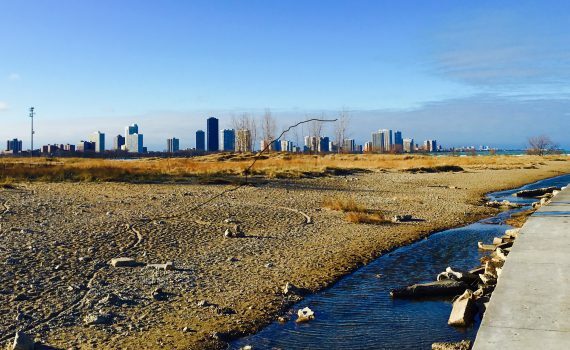 Contaminated ecosystems, be they air, water, soil, interact in cycles via feedback loops multiplying the impact across other biomes and evidenced by fisheries with high levels of mercury from upstream chemical and fertilizer runoff. Unsustainable agricultural and industrial practices contribute to water-related illnesses on account of chemical contaminates and harmful algae and cyanobacteria that endanger water supplies, recreational swimming areas, shellfish, and ultimately human health. Climate change has already impacted ecosystems accelerating vector-borne diseases such as Lyme disease due to seasonal variability and similarly promoted an increase in the West Nile virus due to altered ecological conditions for mosquitos. Climate variability can negatively impact the human body, particularly the young, elderly, and other vulnerable populations groups. 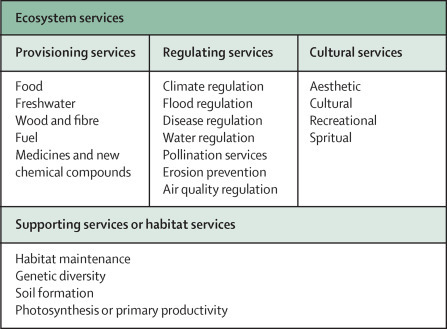 Nature is a producer and multiplier of ecosystems services (Fig.3) generating health and socio-economic co-benefits that sustain and vitalize our built societies and reinforce the capacities of natural systems to combat the threats of climate change. Nature also provides cultural services that are yet to be fully understood for their influence on people’s attitudes, beliefs and potential for environmental stewardship. And yet, the multi-functionality of natural systems to reinforce the triad of sustainability through perpetuating healthy ecosystems and rich biodiversity to function as carbon sinks and support mitigation efforts while enhancing adaptive capacities of socio-ecological systems is already jeopardized. Nature-based solutions provide the cost efficiencies to address our climate challenges as well as deliver the co-benefits of human health and quality of life. In doing so, and with their capacity to bring such added value, their implementation should be mainstreamed at the local levels and in urban development practices as well as form part of national and global climate discussions. Nature-based solutions can broadly contribute to a suite of actions, including technological and policy priorities, necessary to accelerate a change in the climate trajectory. Technological progress buttressed by policy frameworks such as the U.S. Clean Air Act and fuel emissions standards have helped offset a growing U.S. population and accompanying economic demands that perpetuate greater carbon emissions; yet this enabling national legislative infrastructure is being compromised. With the U.S. government’s retreat from the Paris Agreement, the onus for action has fallen upon sub-national authorities, business leaders, and local stakeholders, including health practitioners. And also, long overdue is the role of the general public at the community, household, and individual levels to take responsibility and partake in people-based solutions for climate action. Such actions are represented in election votes, commuter practices and transportation choices, food diets, energy choices, consumption and waste patterns, among other behaviors that can reduce the production of greenhouse gases (GHGs), conserve natural resources, and minimize human impact on the environment. Such behavior change can be cultivated as the result of regulatory policies, fiscal incentives, infrastructure, and choice architecture, sustainable urban planning, and biophilic design as well as by personal attitudes, moral obligation and environmental identity. A significant example of behavioral change occurred during the 1996 Atlanta Olympics, whereby reduced automobile use led to the drop in particulate matter and air pollution during the 17 day period, resulting in a 41% reduction in children’s asthma related cases recorded by the Georgia Medicaid system. The temporarily imposed city traffic regulations generated a powerful positive climate outcome demonstrating the potential of collective impact through individual actions and the benefits generated – presenting future opportunities for public health, environmental justice, and societal well-being. We have now the technological means, economic instruments, nature-based solutions, and even, though untapped, the people-based solutions to move forward with the decarbonization of our economies to safeguard public health and advance climate stability in a multiplicity of ways. The foremost challenge is political. The recently proposed “Healthy Climate and Family Security Act” provides a new opportunity as does the upcoming U.S. mid-term elections.